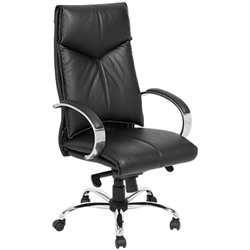 Features: High back Executive chair with Syncro Lock Mechanism. Colours: Now only Available in Black Leather. Base: 5 way polished Chrome base. Options: Medium Back Executive and matching Cantilever visitors chair also available.